Position the two halves of this keyboard to suit your individual comfort needs exactly. 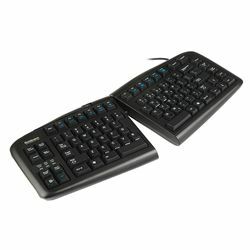 If your current ergonomic keyboard is pretty close--but not precisely--the way you want it, this keyboard is perfect for you. The two sections are easy to adjust, have an incredible range of adjustment and lock securely with a single lever. Requires Microsoft Windows 2000+. Pros: I can't say too much about how easy it is to adjust this keyboard to precisely the most comfortable position. Your wrists and hands will love it, once you get used to not having to cramp your hands into an angle. Cons: Takes some getting used to, but easy to adjust back into the neutral position. My former boss would come to my desk and I would have to flatten the keyboard before he could use it without making mistakes. Easy to put back afterward, though. Other Thoughts: I had mine for about five years.